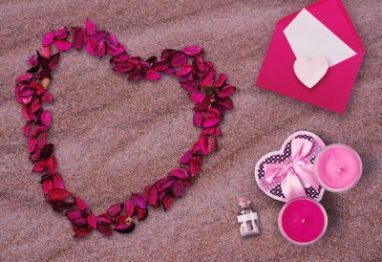 Valentine’s Day is celebrated all around the world and has been for centuries. Many people call this day a “Hallmark Holiday” meaning it was created for commercial purposes rather than an event. However Valentine’s Day dates back to the 1400s. The first known valentine was written in 1415 by Charles, Duke of Orleans, and it still exists today. The valentine was a poem written to his wife who was imprisoned in a tower. Now Valentine’s Day is celebrated all around the world. Let’s follow cupid’s arrow around the world and see the different ways Valentine’s Day is celebrated. This is where Charles, Duke of Orleans was from. His poem to his wife is said to be the first Valentine’s Day card and France has embraced giving loving cards ever since. Even though France is known as one of the most romantic countries in the world, their other Valentine’s Day tradition loterie d’amour (drawing of love) will surprise you. Men and women would fill houses facing one another and take turns calling out their crush’s name. If men were not satisfied with their match they would leave their woman for another. The women who were left unmatched would later have a bonfire and burn photos of the men who wronged them and say cruel things. This event became uncontrollable, so the French government banned it all together. They have recently started to celebrate Valentine’s Day starting in the early 1990s. However, they celebrate it in their own way. Instead of giving roses they exchange pressed white flowers called snowdrops. They also give women a “gaekkebrev” (joking letter), consisting of a funny poem or rhyme written on beautiful cute paper and signed with dots. If the woman receives one of these letters and can guess the sender she receives an Easter egg later that year. In most western cultures Valentine’s Day is all about the women, but in Japan it is all about spoiling your man. Women from Japan are usually shy when it comes to expressing their affections. However, on this day women present their men and even women friends with loving gestures like chocolate. Different kinds of chocolate mean different kinds of love. Japanese chocolate companies came up with another day called “White Day” celebrated on March 14. This is the day the men give women loving gifts. Their Valentine’s Day tradition is like most western cultures but one thing is different. They have a mysterious character called Jack Valentine. This loveable character knocks at children’s doors on Valentine’s Eve and leaves them little treats and small presents. The origins of this traditions is unknown, but the tradition is still very popular today. We follow the arrow back to the U.S. where our tradition is to give gifts to loved ones. Popular gifts being cards, flowers and chocolates. Many children pass out valentines at school. Valentines are small cards with cute saying on the outside and have a candy in the card or taped to the card. Some people use this holiday to give back. If you would like to give back this Valentine’s Day consider giving your unused vehicle to Wheels For Wishes. Wheels for Wishes is a car donation program benefiting Make-A-Wish. We turn unused vehicles into wishes for children. If you would like to donate today you can call us at 1-877-431-9474 or fill out our online donation form. We have customer service representatives standing by to answer any questions that you might have. Your loving donation can change a child’s life forever.